On the first trip, I made the input that there were many facets to the menu and that I’d love to return to try something different. On this visit, I was more interested in trying a sandwich than a full dish. 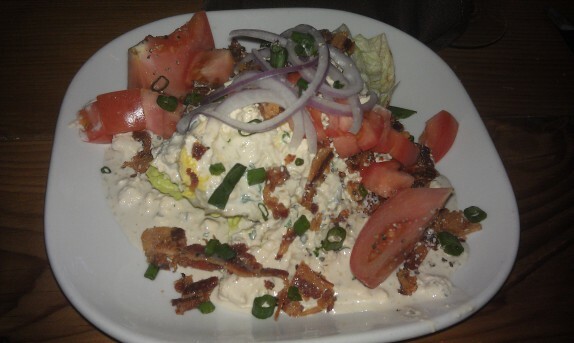 I hadn’t eaten much that day, so I started off with a salad, the BLT Wedge – $8 – Iceberg lettuce slice, chives, bacon, tomatoes, red onion and a creamy gorgonzola dressing. I am aware it is winter and that tomatoes are not regionally in season. The truth is that I usually pick the tomatoes away, even when they’re fresh. If I do eat some, there’s only so much I can tolerate. This salad consisted of about a quarter of a head of lettuce with a tomato and a slice or two of bacon, all smothered in a creamy and tangy dressing. It was very good. The presentation leaves a bit to be desired, but it’s a wedge salad for 8 bucks. I quite enjoyed the dressing, which wasn’t killed with gorgonzola cheese. 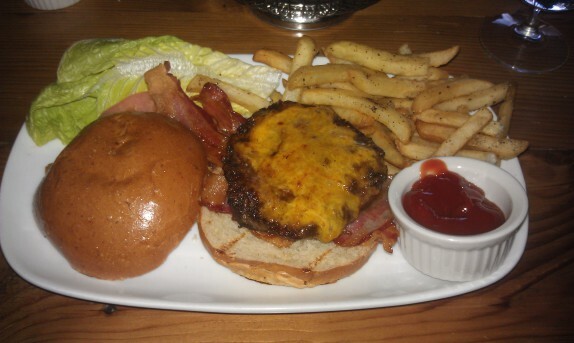 For my main course, I ordered an Old Fashioned Burger – $12 – 8 oz. ground prime rib seasoned with a house-made rub, and added applewood bacon. I ordered the burger medium-rare. The first thing I do when I get a burger or steak is cut it across the center to check the temperature (not literally, sticklers). It came out a bit past medium, more toward medium-well, but I just kept it. For me, as long as the center is juicy, I’m not going to send it back. This burger was decent. The rub imparted some good flavor and texture to the burger. 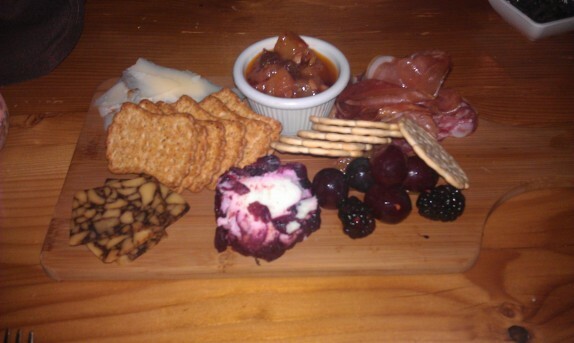 The bread was buttered a bit liberally for my taste, but this added to the juicyness of every bite. The cheese and bacon added some additional flavor. The frites (lemon pepper) didn’t have much essence of lemon and were slightly underdone. Cassie ordered a pizza and it came out presented totally weird. Instead of leaving it round, they turned every slice around with the tip facing the edge of the plate. It sort of resembled a little kid’s drawing of the sun. In the center of the dish was a liberal serving of an arugula salad. I only mention it because it was not what we expected at all. I guess you had to be there. The meal was good for the most part. I’m still not sure I have my head wrapped around what they’re going for between the decor and the menu, but at least it’s not a bad place.